This protocol efficiently directs mouse embryonic stem cell-derived definitive endoderm to mature airway epithelial cells. This differentiation technique uses 3-dimensional decellularized lung scaffolds to direct lung lineage specification, in a defined, serum-free culture setting. Shojaie, S., Lee, J., Wang, J., Ackerley, C., Post, M. Generation of ESC-derived Mouse Airway Epithelial Cells Using Decellularized Lung Scaffolds. J. Vis. Exp. (111), e54019, doi:10.3791/54019 (2016). Lung lineage differentiation requires integration of complex environmental cues that include growth factor signaling, cell-cell interactions and cell-matrix interactions. Due to this complexity, recapitulation of lung development in vitro to promote differentiation of stem cells to lung epithelial cells has been challenging. In this protocol, decellularized lung scaffolds are used to mimic the 3-dimensional environment of the lung and generate stem cell-derived airway epithelial cells. Mouse embryonic stem cell are first differentiated to the endoderm lineage using an embryoid body (EB) culture method with activin A. Endoderm cells are then seeded onto decellularized scaffolds and cultured at air-liquid interface for up to 21 days. This technique promotes differentiation of seeded cells to functional airway epithelial cells (ciliated cells, club cells, and basal cells) without additional growth factor supplementation. This culture setup is defined, serum-free, inexpensive, and reproducible. Although there is limited contamination from non-lung endoderm lineages in culture, this protocol only generates airway epithelial populations and does not give rise to alveolar epithelial cells. Airway epithelia generated with this protocol can be used to study cell-matrix interactions during lung organogenesis and for disease modeling or drug-discovery platforms of airway-related pathologies such as cystic fibrosis. Directed differentiation of pluripotent cells to the lung lineage is dependent on precise signaling events in the microenvironment 1,2. Due to the dynamic nature of this process it has been challenging to mimic the precise events of lung organogenesis in vitro. Recent reports have used step-wise lineage restriction strategies with soluble growth factor supplementation of two-dimensional cultures to achieve lung differentiation3-8. In step-wise differentiation protocols, pluripotent cells, whether embryonic stem cells (ESC) or induced pluripotent stem cells, were first differentiated to the definitive endoderm germ layer. Endodermal cells were subsequently pushed to an anterior endoderm fate and thereafter to lung progenitor cells, as identified by the expression of homeodomain-containing transcription factor NKX2-1. These lung progenitors were further differentiated to proximal (airway) or distal (alveolar) lung epithelial cells with continued growth factor supplementation. Such 2-dimensional strategies have had some success in generating lung epithelial cells, however there are several limitations including unclear efficiencies, possible contamination from other endodermal lineages, lack of a 3-dimensional (3D) structure, and in some instances use of undefined cultures with serum supplementation. Culture of pluripotent or differentiated cells on decellularized lung scaffolds is increasingly used as an assay to assess the regenerative potential of seeded cells in forming lung epithelial structures3,5,6,8,9. Such reports culture seeded cells on scaffolds with continued growth factor or serum supplementation. Lung development involves the division, migration, gene expression and differentiation of individual cells in response to environmental cues. The extra cellular matrix (ECM) is a latticework of glycoproteins that in addition to providing structural support, directs tissue morphogenesis by integrating and regulating these processes10,11. By using the lung ECM scaffold as a natural platform for endoderm culture to better mimic the in vivo lung developmental milieu, we have generated stem cell-derived airway epithelial cells in a defined 3D-culture setting with high efficiency and reproducibility. Rat lung ECM scaffolds were generated by decellularization as well as mouse ESC-derived endodermal cells were generated and subsequently seeded onto these scaffolds. Dual expression of CXCR4 & c-KIT proteins indicates a definitive endoderm cell identity and cells positive for both SOX2 & NKX2-1 expression are identified as airway (proximal lung) progenitor cells. Definitive endoderm cells were cultured at air liquid interface (ALI) for up to three weeks to generate functional airway epithelial cells in vitro. This protocol promotes lung lineage differentiation of definitive endoderm as early as 7 days, observed with the emergence of NKX2-1+/SOX2+ early proximal lung progenitors. By day 14 and 21 of culture mature airway epithelial cell populations emerge including ciliated (TUBB4A+), club (SCGB1A1+), and basal (TRP63+, KRT5+) cells with morphological and functional resemblance to native mouse airways. This protocol demonstrates the importance of the 3D-matrix microenvironment for achieving robust differentiation to airway epithelial cells. Animal experiments were carried out in accordance with the Animal Care Committee guidelines of the Hospital for Sick Children Research Institute. Euthanize adult Wistar rats using CO2 chamber. Place animal in the chamber and start 100% CO2 exposure at a fill rate of 10-30% of chamber volume per minute. Observe animal for unconsciousness; this will occur after approximately 2-3 min. If unconsciousness does not occur in this time period, check fill rate and chamber seal. Following unconsciousness, observe animal for faded eye color and lack of respiration. If both are observed, maintain CO2 filling for 1-2 min and then remove animal from chamber for procedure. Secure animal to dissecting surface by fixing forepaws and hind legs, and spray down the chest and abdomen area with 70% ethanol. Access the heart and lungs by opening the thoracic cavity using a vertical incision along the sternum. Make small incisions through diaphragm first to cause the lungs to retract, reducing the chance of puncturing the lungs. Ligate the inferior vena cava with a suture and place a small incision in the left atrium with small dissecting scissors. Using a prepared 10 ml syringe with a 25 G needle filled with heparinized Hank’s balanced salt solution (HBSS) (10 U/ml heparin in HBSS), start lung perfusion by inserting the needle into the right ventricle to push the buffer through the pulmonary circulation (rate of 2 ml/min). Continue this procedure until the lungs turn white and the fluid flowing from the left atrium runs clear. Following perfusion, expose the trachea and cannulate with a plastic catheter near the thyroid cartilage and secure in place with a suture. Setup a gravity perfusion system by fixing a 10 ml syringe to a retort stand and clamp. Remove and discard syringe plunger. Secure the maximum filling point on syringe barrel at 20 cm above the lungs. Attach a two-way stopcock to the end of the syringe, and a long plastic tubing to the other end of the stopcock for delivering decellularization solution to the cannulated trachea. Pour solution into syringe and allow solution to fill attached plastic tubing and catheter. Lavage the lungs by filling to total lung capacity (approximately 12 ml) for 1 min and remove the plastic catheter from the trachea to allow the fluid to flow out of the lungs. Do not fill syringe more than 10 ml when lavaging lungs to keep pressure below 20 cm of H2O. Repeat lavage of lungs eight times with decellularization solution, followed by 10 rinses with phosphate-buffered saline (PBS). Dissect the trachea and lungs free from the neck and chest cavity and remove from the animal. Keep tissue in cold PBS at 4 °C until preparation for vibratome sectioning. Prepare approximately 15 ml of 2% and 4% (w/v) agarose, and enough 6% (w/v) agarose for embedding all lobes into small rectangular blocks. Dissolve low melting point agarose powder in PBS by microwaving. Transfer the agarose to 50 ml tubes on a heat block and maintain temperature above 40 °C to avoid gelling. Dissect decellularized lung at the end of each lobar bronchus to detach each lobe (cranial, middle, accessory, and caudal right lobes and the left lobe) using small scissors. Pat dry each lobe using absorbent sheets to remove excess PBS and place inside 2% (w/v) agarose while on the heating block. Remove each lobe after 5 min of coating in agarose, place in a Petri dish and allow the surface to gel for 1 min on a cold plate. Gently place lobes back into 4% (w/v) agarose, cool after 5 min, and repeat coating once more with the 6% (w/v) agarose. After sequential coating of each lobe, embed each lobe separately in 6% (w/v) agarose using metal base molds with at least 3 mm of agarose surrounding the tissue from the edges. Orient each lobe using forceps by positioning the lobe's largest flat edge at the surface of metal mold facing the experimenter. This edge will be the side fixed to the specimen plate for vibratome sectioning. Allow blocks to gel on cold plate for at least 30 min prior to sectioning with vibratome. Store blocks in a humidified chamber for up to 12 hr at 4 °C prior to vibratome sectioning. Setup the vibratome by filling the sectioning chamber with cold PBS12. Maintain cold temperature throughout sectioning with the surrounding ice bath. Remove blocks from metal molds and use a razor blade to trim down excess agarose surrounding lobes, while keeping approximately 3 mm from the edge of the tissue. Fix tissue to the center of specimen plate using adhesive, and submerge plate into the PBS-filled sectioning chamber. Setup sectioning boundaries on vibratome by selecting the following speed, amplitude, and thickness values respectively: 0.2 mm/sec, 1.85 mm, and 350 µm. Note: Both longitudinal and transverse sections of the lobe orientation are acceptable. Section each lobe completely. Manually cut sections free using small scissors if a section is not fully separated by blade at the end of the section sequence. Collect scaffold sections gently and keep in PBS on ice until the next step. Note: Sections generated will include both the proximal and distal lung areas and both sources can be used for recellularization; however, most of the surface will encompass distal lung. Transfer the 350 micron thick scaffold sections from PBS to microcentrifuge tubes (up to 30 sections/tube) and treat with nuclease (90 U/ml in PBS) (see List of Materials) for 12 - 24 hr at RT, on a rotator. Following nuclease treatment, transfer sections using forceps to new microcentrifuge tubes and treat with antimicrobial solution (200 U/ml penicillin streptomycin and 25 µg/ml amphotericin B in PBS) under sterile conditions for 6 hr at RT, on a rotator. Note: Scaffolds can be stored in antimicrobial solution for up to one week at 4 °C before use. Following the decontamination step with antimicrobial solution, rinse scaffolds twice with PBS under sterile conditions and transfer to serum free differentiation media (SFDM) prior to seeding with cells. Maintain mouse ESC lines under feeder-free, serum free culture using 2i conditions13. Start endoderm induction by removing cells from adherent pluripotent culture by trypsinization. Resuspend cells in SFDM and seed at a density of 20,000 cells/ml in low adherent plates for three days without media change to allow for EB formation. After three days gently transfer the EBs into 50 ml conical tubes using a 10 ml pipette and allow them to collect at the bottom for 3 min at RT. Carefully aspirate media and add fresh SFDM media supplemented with 50 ng/ml activin A. Seed cells back onto the low adherent plates at a 1:2 density and culture for three additional days to achieve definitive endoderm differentiation. Collect day 6 EBs, dissociate with trypsin and label for c-KIT and CXCR4 expression using conjugated fluorescent antibodies14. Sort labeled cells using fluorescence-activated cell sorting (FACS) for expression of both markers to obtain an enriched definitive endoderm population15. Transfer each decellularized scaffold section (step 1.2.9) from SFDM onto a hydrophobic floating membrane (8 µm pore size) using sterile forceps. Ensure scaffold sections are spread evenly on membrane. Prepare 6- or 12-well plates by filling wells with 1 or 0.5 ml of SFDM, respectively. Gently place membranes into wells, allowing the membrane to float on top of media, creating an air-liquid culture setup. Following FACS for definitive endoderm markers (step 2.2.2) count sorted cells using a hemocytometer, spin down at 400 x g for 5 min and resuspend in SFDM. Resuspend cells to obtain a volume containing approximately 100,000 cells/10 µl/scaffold. To recellularize scaffolds, pipette 10 µl of cells directly onto each prepared section from step 3.1.2. Replace SFDM media in cultures every 48 hr. Aspirate the old media by holding the plate at a slight incline to avoid disrupting the culture. Slowly add fresh SFDM to culture along the side of the well to prevent sinking of floating membrane. Maintain air-liquid cultures for up to 21 days to achieve differentiation of seeded cells in to mature airway epithelia. Note: Recellularized sections can be processed for tissue staining and immunofluorescent (IF) microscopy at any time point during cell culture16. As outlined in this protocol, robust differentiation of definitive endoderm to mature airway epithelial cells can be achieved using extended culture of seeded cells on decellularized lung scaffold sections. It is recommended that decellularized scaffolds be characterized to ensure (1) host cells are completely removed, and (2) extracellular matrix proteins are preserved prior to using scaffolds for differentiation. Decellularization can be assessed using tissue staining with hematoxylin and eosin (H&E) and 4',6-diamidino-2-phenylindole (DAPI), as illustrated in Figure 1A. High-magnification scanning electron microscope (SEM) analysis of scaffolds confirms the absence of host cells and intact matrix architecture, as illustrated in Figure 1B. Additional characterization of the remaining scaffold by tensile testing and immunostaining for matrix proteins can be carried out to ensure preservation of the ECM following decellularization16. Non-adherent culture of ESCs in SFDM media for six days results in the formation of cell aggregates (EBs) as illustrated in Figure 2A. Three days of activin A treatment results in definitive endoderm induction. Lineage restriction of ESC to definitive endoderm can be confirmed by upregulation and expression of endoderm lineage-associated genes and proteins17, and cannot be asserted morphologically. Endoderm-induction efficiency ranges from 50-70% depending on the ESC line used. Experiments were carried out in mouse ESC lines: R1 (Nkx2-1mCherry), G4 (dsRed-MST), and 129/Ola (Bry-GFP/Foxa2-hCD4), while all data illustrated in this manuscript is using the R1 cell line. The double positive CXCR4+/c-KIT+ definitive endoderm population is sorted as illustrated in Figure 2B, seeded onto 3D lung scaffolds, and cultured for up to 21 days at air-liquid interface in SFDM. It is important to sort and enrich for definitive endoderm as limited organization and differentiation is achieved with culture of unsorted cells from heterogeneous day 6 EBs as illustrated in Figure 2C. Structures formed by sorted cells on scaffolds are reminiscent of developing lung (embryonic day 13.5) as illustrated in Figure 2C-D. In our experience, a seeding density of 100,000 sorted cells/scaffold has yielded the best scaffold repopulation. Differentiation to the lung lineage is observed as early as 7 days following scaffold culture. 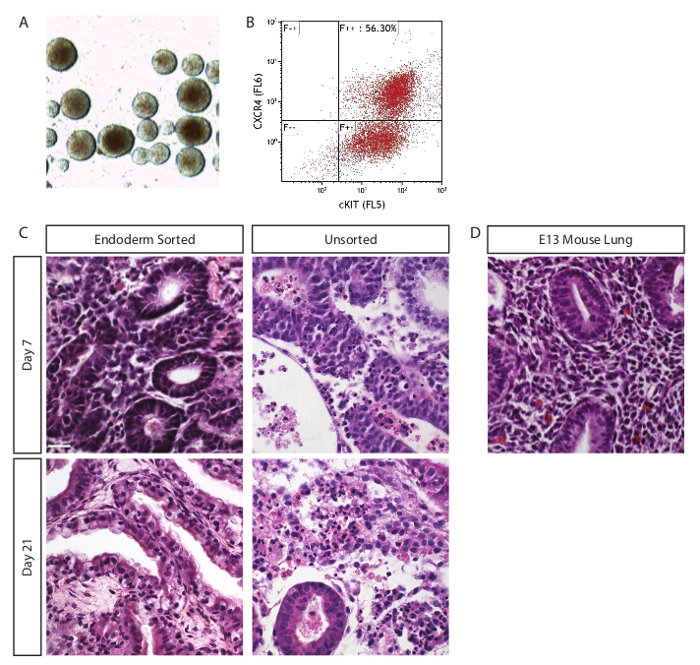 Airway epithelial progenitor cells positive for NKX2-1 and SOX2 are detected using IF confocal analysis as illustrated in Figure 3A. SOX2 positive, NKX2-1 negative cells are likely pluripotent endodermal cells that have not differentiated to the lung lineage. With longer culture these cells may start to express NKX2-1 or undergo apoptosis without adequate support in the microenvironment. 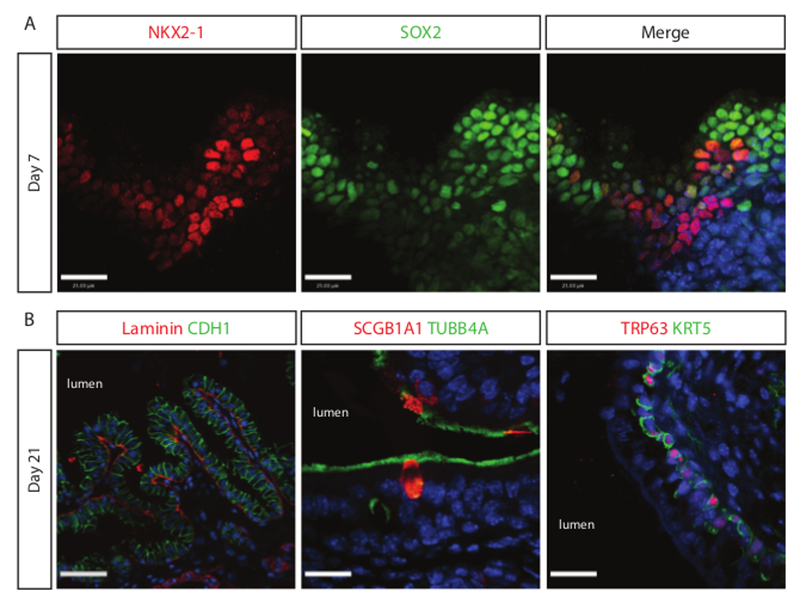 IF analysis of day 21 cultures reveals a mature airway epithelial population containing TUBB4A+ ciliated cells, SCGB1A1+ club cells, and TRP63+/KRT5+ basal cells as illustrated in Figure 3B. SEM analysis of the surface of day 21 cultures reveals morphological similarity of stem cell-derived cultures to mouse airways. Both isolated matrix proteins (collagen I, collagen IV, fibronectin, laminin) and decellularized rat kidney scaffolds were unable to promote lung-lineage differentiation when seeded with definitive endoderm and cultured under the same conditions as described above16. This demonstrates that the 3D microenvironment created by lung-derived scaffolds is distinct from kidney-derived scaffolds in its ability to promote lung-lineage differentiation of seeded endodermal cells. Figure 1. Decellularization technique removes cellular components and preserves ECM. (A) H&E (top panel) and DAPI (lower panel) staining of natural and decellularized lung tissue showing the absence of nuclei following decellularization. 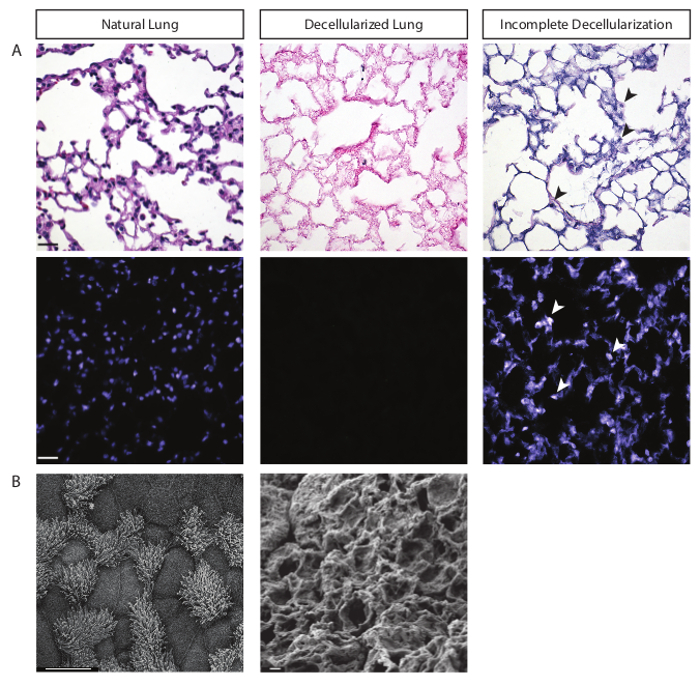 Right panel shows examples of tissue sections from lungs without optimal decellularization. Arrowheads show remaining nuclei on scaffolds due to incomplete decellularization, highlighting the importance of optimizing technique before recellularization. Scale bar = 25 µm. (B) SEM images of natural and decellularized lung, showing absence of cells and preservation of matrix architecture on decellularized scaffolds. Scale bar = 10 µm. Please click here to view a larger version of this figure. Figure 2. Sorted ESC-derived definitive endoderm results in optimal recellularization. (A) Day 6 embryoid bodies (EBs) following three days of activin A treatment for promoting definitive endoderm differentiation. (B) The EBs are sorted by FACS for dual expression of surface markers CXCR4 and c-KIT to isolate the definitive endoderm population. This population will be seeded on decellularized scaffolds. (C) H&E staining of recellularized scaffolds at day 7 and day 21 of culture. Left panel represents organized, airway-like structures following seeding with sorted cells, and right panel represents disorganized, highly proliferative unsorted cells on scaffolds highlighting the importance of sorting of cells prior to recellularization. Scale bar = 30 µm. (D) H&E staining of embryonic day 13.5 mouse lungs. Please click here to view a larger version of this figure. Figure 3. Extended culture of definitive endoderm on natural lung scaffolds directs differentiation to airway epithelial cells. (A) Proximal lung progenitor cells (NKX2-1+/SOX2+) are detected following seven days of culture on decellularized scaffolds. Scale bar = 15 µm. (B) Left image shows mature pseudostratified epithelial cell (CDH1+) structures lined by basement membrane protein laminin on the basal side of structures. Center and right image show mature airway epithelia complete with ciliated cells (TUBB4A+), club cells (SCGB1A1+) and basal cells (KRT5+/TRP63+). Left image scale bar = 30 µm; center and right image scale bar = 15 µm. Please click here to view a larger version of this figure. The protocol described here generates mature ESC-derived airway epithelia using only natural lung scaffolds to direct differentiation with no other supplementation. This culture setup is defined, serum-free, inexpensive, and reproducible. No growth factor supplementation of base differentiation media is required. Previously published methods for generating stem cell-derived lung epithelial cells have used 2-dimensional strategies with growth factor supplementation to promote lineage restriction3,4,8,18,19. The technique described here is advantageous over these methods for several reasons, including: defined culture conditions, high differentiation efficiency to functional airway cells, limited contamination from other endodermal lineages (thyroid, liver, pancreas), and a 3D differentiation microenvironment. This technique yields similar results with mouse-derived ECM and can therefore be modified to generate decellularized scaffolds using mouse lungs. Rat-derived ESCs differentiated to definitive endoderm and seeded onto scaffolds using this protocol also differentiate to airway epithelia. Decellularized scaffolds can be stored in decontamination solution at 4 °C for up to 7 days prior to recellularization. Scaffolds kept for longer durations may be functional, however we have not tested to confirm this. To achieve efficient organization and differentiation it is required to enrich for definitive endoderm by FACS following induction with activin A. Non-endoderm cells in day 6 EBs often express pluripotency marker Oct4 and if seeded on scaffolds will continue to proliferate without organization and specification to the lung lineage. The seeding density can also be adjusted based on cell line-specificity to achieve complete recellularization of scaffolds. A limitation of this protocol is in its inability to promote differentiation to alveolar epithelial cells. Although NKX2-1+/SOX9+ distal progenitor cells are detected after seven days of culture on scaffolds, this population is not present at day 14, and day 21. Markers of mature type I alveolar epithelial cells (AQP5) and type II alveolar epithelial cells (SFTPB, SFTPC) are not detected at any stage during scaffold culture. This may be due to a requirement for additional growth factor supplementation and submerged culture conditions to promote alveolar lineage specification, while as described here, matrix proteins and the remnant matrix-bound growth factors on decellularized scaffolds is sufficient to promote airway lineage differentiation. The critical step for promoting differentiation of definitive endoderm to airway epithelial cells using lung scaffolds is optimization of the decellularization process. Cellular components must be completely removed while matrix components are preserved. Tissue staining for nuclear material using DAPI, ultra-structural analysis of scaffolds with scanning and transmission electron microscopy, and DNA assays can be used to confirm removal of all cellular components. ECM protein composition of scaffolds can be assessed using IF staining and immunoblot analysis for matrix proteins: collagen I, collagen IV, elastin, fibronectin, heparin sulfate proteoglycans, and laminin16. These stem cell-derived lung epithelia can be used in disease modeling and drug-discovery platforms of airway-related pathologies such as cystic fibrosis. The potential of these cell-matrix constructs in regenerative applications such as tissue repair and cell therapy can be examined by in vivo transplantation of engineered constructs in various mouse models. Furthermore, this 3D in vitro method for airway differentiation can be easily adapted to study various parameters effecting lung lineage specification by manipulating growth factor availability and cell-matrix signaling of cultures during different stages of differentiation on scaffolds. There are no competing financial interests to declare. We wish to thank Dr. Rossant and Dr. Bilodeau for the Nkx2-1mcherry ESC used in experiments depicted in Figures 1-3. FACS was performed in The SickKids-UHN Flow Cytometry Facility. This work was supported by operating grants from the Canadian Institutes for Health Research and an infrastructure grant (CSCCD) from the Canadian Foundation of Innovation. Discher, D. E., Mooney, D. J., Zandstra, P. W. Growth Factors, Matrices, and Forces Combine and Control Stem Cells. Science. 324, (5935), 1673-1677 (2009). Daley, W. P., Peters, S. B., Larsen, M. Extracellular matrix dynamics in development and regenerative medicine. J. Cell Sci. 121, (3), 255-264 (2008). Ghaedi, M., et al. Human iPS cell-derived alveolar epithelium repopulates lung extracellular matrix. J. Clin. Invest. 123, (11), 4950-4962 (2013). Huang, S. X. L., et al. Efficient generation of lung and airway epithelial cells from human pluripotent stem cells. Nat. Biotechnol. 32, (1), 84-91 (2014). Jensen, T., et al. A rapid lung de-cellularization protocol supports embryonic stem cell differentiation in vitro and following implantation. Tissue Eng. Part C: Methods. 18, (8), 632-646 (2012). Longmire, T. A., et al. Efficient derivation of purified lung and thyroid progenitors from embryonic stem cells. Cell stem cell. 10, (4), 398-411 (2012). Wong, A. P., et al. Directed differentiation of human pluripotent stem cells into mature airway epithelia expressing functional CFTR protein. Nat. Biotechnol. 30, (9), 876-882 (2012). Gilpin, S. E., et al. Enhanced Lung Epithelial Specification of Human Induced Pluripotent Stem Cells on Decellularized Lung Matrix. Annal. Thorac. Surg. 98, 1721-1729 (2014). Cortiella, J., et al. Influence of Acellular Natural Lung Matrix on Murine Embryonic Stem Cell Differentiation and Tissue Formation. Tissue Eng. Part A. 16, (8), 2565-2580 (2010). Princivalle, M., De Agostini, A. Developmental roles of heparan sulfate proteoglycans: a comparative review in Drosophila, mouse and human. Int. J. Dev. Biol. 46, 267-278 (2002). Thompson, S. M., Jesudason, E. C., Turnbull, J. E., Fernig, D. G. Heparan sulfate in lung morphogenesis: The elephant in the room. Birth Defects Res. Part C, Embryo Today. 90, (1), 32-44 (2010). Zimmermann, M., et al. Improved reproducibility in preparing precision-cut liver tissue slices. Cytotechnology. 61, (3), 145-152 (2009). Ying, Q. -L., et al. The ground state of embryonic stem cell self-renewal. Nature. 453, (7194), 519-523 (2008). Fox, E., et al. Three-Dimensional Culture and FGF Signaling Drive Differentiation of Murine Pluripotent Cells to Distal Lung Epithelial Cells. Stem Cells Dev. 24, (1), 21-35 (2014). Basu, S., Campbell, H. M., Dittel, B. N., Ray, A. Purification of Specific Cell Population by Fluorescence Activated Cell Sorting (FACS). J. Vis. Exp. (41), e1546 (2010). Shojaie, S., et al. Acellular lung scaffolds direct differentiation of endoderm to functional airway epithelial cells: requirement of matrix-bound HS proteoglycans. Stem Cell Reports. 4, 1-12 (2015). Kubo, A., et al. Development of definitive endoderm from embryonic stem cells in culture. Development. 131, (7), 1651-1662 (2004). Wong, M. D., Dorr, A. E., Walls, J. R., Lerch, J. P., Henkelman, R. M. A novel 3D mouse embryo atlas based on micro-CT. Development. 139, (17), 3248-3256 (2012).